Walter Rice cupped the little tomato plant in his hand and showed his grandson how to nip off the bottom branchlets with a thumbnail. "Now, you bury it right up to the leaves, boy, so's you get a nice bushy plant, and you'll have your twenty-five baskets on the first pickin'." 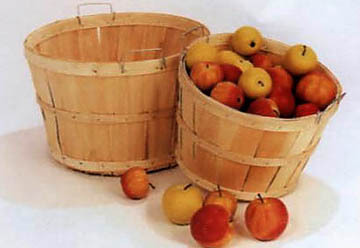 Twenty-five baskets of ripe tomatoes, delivered to the A&P canning plant, would bring enough to buy a Western Flyer bicycle. Steven Rice thought of red, white and blue handlebar streamers in the wind as he set in the new plants where the old man punched the mounded soil with his cane. In June the mornings were cool, and Steven hoed out the weeds, and inspected his plants for signs of blossoms. A dry spell came in July, and he passed the afternoons on the long slow swing under the elm tree, looking out at the green rows in the shimmering heat, listening for thunder through the drone of locusts. Finally, it rained a little in the night, then a lot more the next night. Then the yellow blossoms came, more than he had ever seen; and a long time afterward the tiny green tomatoes appeared. One day he found a tomato that had escaped his notice before. It had ripened before all the others, and Steven proudly bore it to his mother's kitchen. The thing was so big and sweet that she made sandwiches for the two of them, and had enough left to make one for Steven to take to his grandfather, working in his own tomato field. Walter Rice sat in the shade beside his field, and ate the sandwich Steven had brought him. "A&P's gonna start takin' tomatoes in a couple more weeks, boy. It seems we just put those plants in, and now it's almost pickin' time. "It's been a long time, Grandpa," said Steven. "A long time to wait for a bicycle." Walter smiled at the boy. "It didn't seem long to me. But then, I wasn't waitin' for a bicycle." The mornings had become cool again, and it was barely dawn the day Steven loaded twenty-five baskets of bright tomatoes on his grandfather's old pickup truck. They were third in line at the A&P plant, and waited in the steam clouds that smelled of ketchup. Later, as they drove home with a new Western Flyer carefully tied upright in the back of the pickup, Walter asked his grandson, "Did you notice that toboggan they had hangin' on the wall, Steven? If you start savin' now, maybe you could have that by winter time." Steven was on his knees, looking back at the red, white and blue handlebar streamers playing in the wind. "It'll be a long time before it snows, Grandpa," he said. Remember When life was simpler? Wish you could share those memories with somebody else? According to Leon Dixon, who was the official curator of the National Bicycle History Archive of America, the Western Flyer bicycle is properly termed a Classic Bicycle, a phrase coined by the NBHAA back in the early 1970's to describe those sought-after collectibles which were built from roughly 1920 through approximately 1965. Classic Bicycles therefore, fall into a different category than Antique Bicycles. Classic Bicycles were essentially an American phenomenon, since no other country in the world produced streamlined art deco and deluxe heavyweight bicycles laden with built-in accessories. 1.) Single-tube tire (glue-on doughnut type tires with no separate inner tube) used mainly from the early 1900s - early 1930s. 2.) Balloon tire ( usually 2.125 tires with separate inner tube and clincher rims) covering 1930s through the 1950s. 3.) Middleweight tire (usually 1.75 tire covering 1954 through the 1960s). The most sought-after of any of the Classic bicycles are the deluxe, top-of-the-line streamliners of any make. Built-in items such as horn, speedometer, and lighting all add to value, making the bicycle more desirable. 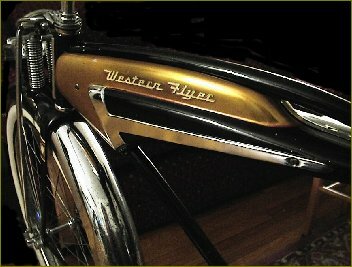 Several different bicycle manufacturers produced bicycles under the "Western Flyer" brand. They did this under contract to Western Auto Stores, Inc. from the 1920's on. The bikes were sold through both the Western Auto Catalog, and by Western Auto Stores themselves, which were often located in small towns. The bikes were good looking and nicely priced, and there might be as many as 30 models introduced every year. The various models fell into each of the Classic categories, single tube, balloon and middleweight. The NBHAA has the world's largest library of original classic bicycle literature- over 30,000 catalogues, photos and books, as well as the world's only classic BICYCLE FILM ARCHIVE (including nearly 100 actual bicycle films- not videos). Whether it's Schwinn, Shelby, Columbia, Evans, Evinrude, Elgin, J.C. Higgins, Western Flyer, Hawthorne, Hiawatha, Roadmaster, Pierce, Iver Johnson, Indian, Rollfast, Firestone, B.F.Goodrich, Good Year, Bowden, Manton & Smith, Mead, Ranger, Ingo-Bike, Murray, Mercury, Huffman, Huffy, Dayton, Colson, Monark, Silver King, Stelber, Ross, Harley Davidson, Whizzer, Dynacycle, Wasp, Pow-wow, Travis, Marman, Jack & Heintz or what-have-you, the National Bicycle History Archive of America (NBHAA) says they can identify virtually any American-built bicycle or motorized bicycle from this period. Like bikes? You can also visit the Bicycle Museum of America's web site to see how the bicycle has evolved over the years. WHAT DO YOU KNOW ABOUT THE TOMATO ? Did you know that botanically speaking, tomatoes are actually a fruit? True story!. This is because, generally, a fruit is the edible part of the plant that contains the seeds, while a vegetable is the edible stems, leaves, and roots of the plant. Since tomatoes are a fruit, they are also an excellent source of Vitamin C (yes, just like oranges are!). 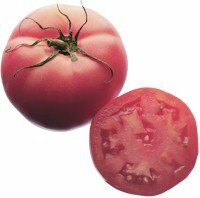 Tomatoes are also high on the list of America's favorite garden plants. They are adaptable, easy to care for, and can be grown in containers or in gardens. WHERE DID IT COME FROM? The tomato is native to the Americas. It was initially cultivated by Aztecs and Incas as early as 700 A.D. Europeans first saw the tomato when the Conquistadors reached Mexico and Central America in the 16th century. Tomato seeds were taken back to Europe where they quickly found favor in the Mediterranean countries of Spain, Portugal and Italy. As the tomato traveled north, it was veiled in mystery. The French called it “The Apple of Love,” the Germans “The Apple of Paradise;” but the British, while admiring its brilliant red color, disclaimed the tomato as a food--they believed it was poisonous. This same fear persisted among colonists in the United States until the early 19th century; but in 1812, the Creoles in New Orleans put their cooking on the map with their tomato-enhanced gumbos and jambalayas. The people of Maine quickly followed suit, combining fresh tomatoes with local seafood. By 1850, the tomato was an important produce item in every American city. 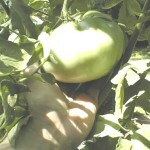 People were planting tomatoes in their home gardens, while farmers commercially produced fresh tomatoes throughout the year. When cold weather halted local production, consumers relied on areas with temperate climates, like Florida and California, to furnish their supply of tomatoes. Tomatoes are a good source of vitamin A, and are high in Vitamin C.
Tomato plants are widely available in the spring, they can be found in local nurseries, and sometimes they're even sold in grocery stores. An easy way to feed tomatoes is to punch holes in bottom of plastic milk jug. Bury jug almost to the top next to tomatoes. Fill jug with water or liquid fertilizer and the carton will slowly release nutrients over time. Since tomatoes are vines, and the growing tomatoes can get heavy, you'll want to tie the vines to stakes, to help support them. To grow ten pounds of tomatoes, you'll need to plant about a ten foot row of tomato plants. 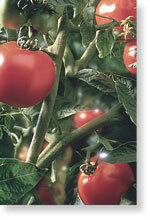 About 3 to 5 plants per person will provide ample tomatoes for you to enjoy with meals throughout the season. If you want to preserve tomatoes for use later in the year as well, you'll want to increase your planting so that you have 5 to 10 plants per person. You can use your tomatoes for spaghetti sauce, or even make catsup (sometimes spelled ketchup) with them. How much does a basket of tomatoes weigh, and what does that equal? 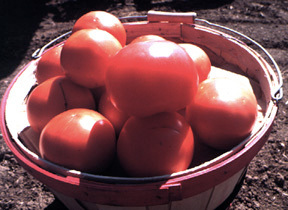 Florida and California produce the majority of the tomato crop in the United States. California, which is number 2, produces over a billion pounds a year, all by itself! That's a LOT of tomatoes!